The fire has burned more than 270,000 acres and is about 65 percent contained. The Thomas Fire is now the largest recorded blaze in California's history. 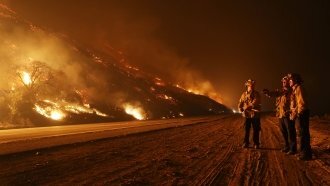 The Southern California fire started burning Dec. 4, and as of Friday evening was only 65 percent contained. It's burned 273,400 acres and damaged more than 1,000 structures. One person has died. The record size is on par with this year's fire season in general. State officials have called it the most destructive season the state has seen. Harsh winds and dry conditions helped stoke fires that have wrought havoc on the state this year. And although the Thomas Fire was the largest, it wasn't the most destructive. The Tubbs fire in Sonoma County damaged more than 5,000 structures and caused 22 deaths. The last record holder for California's largest fire was 2003's Cedar Fire in San Diego county.